Visiting Chicago with young kids can present a challenge. While the city showcases fantastic family-friendly hotels and some of the top attractions in the world, a three-year-old traveling companion isn't likely going to want to stare at a ​Seurat painting at the Art Institute of Chicago. Here are some of the best Chicago attractions for kids in the preschool and younger set. The Water Tower Place-based family-friendly gallery serves as dedicated space for Dr. Seuss's artwork. Visitors may view the various collections--which include sculptures, illustrated art and "secret" art--and have the option to buy. Some of the works have never been exhibited before. 835 N. Michigan Ave., 312-475-9620. Located on the ever popular Navy Pier, little kids absolutely love the Chicago Children's Museum, which offers plenty of fun, hands-on exhibits such as the Dinosaur Expedition, Kids Town and the three-floor climbing structure Climbing Schooner. Afterward, take your tot on the Pier's merry-go-round, or to the fountain with fun computerized jet streams in Gateway Park at the west entrance of the pier. 600 E. Grand Ave., 312-527-1000. Another option is the Kohl Children's Museum, located approximately 30 minutes from downtown Chicago. The Kohl also has plenty of interactive exhibits, as well as a two-acre nature park open in the warmer months that features climbing structures, a water wall, sensory garden, interactive sculptures and a grass maze. Permanent exhibitions include the Baby Nursery, Adventures in Art and Pet Vet. 2100 Patriot Boulevard, Glenview, Ill., 847-832-6600. Is your preschooler a LEGO nut? Then head to the Chicago suburb of Schaumburg to the Legoland Discovery Center and its various LEGO-themed attractions with moving LEGO models, a LEGO build and test area and a miniature LEGO replica of the Chicago skyline. You'll also find a number of hotels in Schaumburg, which should make the trip even more tempting. 601 N. Martingale Rd., Schaumburg, Ill., 866-929-8111. The Peggy Notebaert Nature Museum opened in 1999 in Lincoln Park with a clear mission: to educate the public, especially urban dwellers, on the importance of maintaining the quality of nature that surrounds us and steps to take that can help the environment. Your little ones will learn a little bit about nature and the environment that surrounds them, with a look at Chicago's waterways, an animal habitat play area, a year-round butterfly garden and more. The museum also hosts traveling exhibits that change every few months. Hotel Lincoln is nearby. 2430 N. Cannon Dr., 773-755-5100. The fish and other aquatic life at the Shedd Aquarium appeal to pretty much all ages from 0 to 100, especially the regular marine mammal shows in the Abbott Oceanarium. The centerpiece of the aquarium, the Caribbean Reef is a 90,000-gallon circular tank and filled with stingrays, sharks, eels, a sea turtle, and an assortment of tropical fish. A diver hand feeds the fish and answers questions (while underwater!) several times a day. 1200 S. Lake Shore Dr., 312-939-2426. 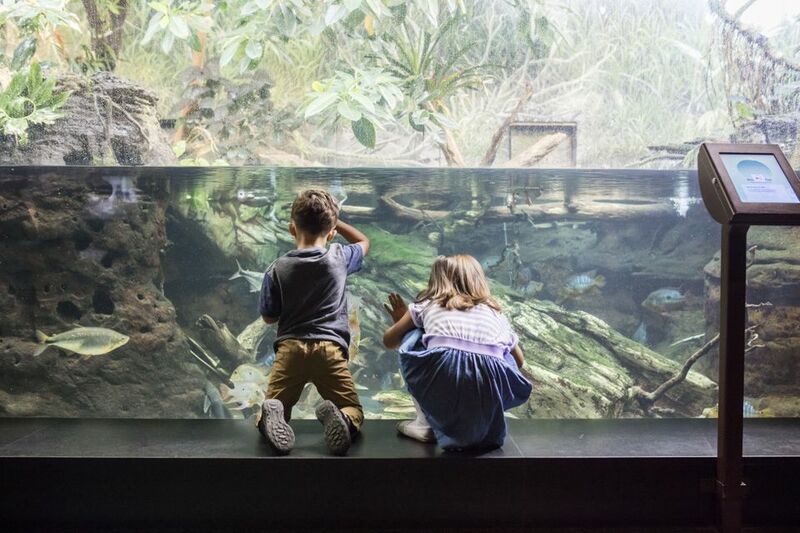 It would be hard to find a kid that doesn't like the zoo, especially the Lincoln Park Zoo, with its historical architecture and world-class wildlife exhibits nestled among lagoons and mature trees not far from Chicago's downtown. Families traveling on a budget will appreciate the fact that the zoo is open free of charge 365 days a year. Lake Shore Drive and Fullerton Parkway, 312-742-2000. An alternative to Lincoln Park is the Brookfield Zoo, located in the nearby western suburb of (you guessed it) Brookfield. Brookfield Zoo is spread out over 200 acres and offers larger, cageless exhibits such as Tropic World, a massive indoor habitat with three distinct environments filled with primates from around the globe. 1st Avenue and 31st Street, Brookfield, Ill., 708-688-8000. While the science and engineering concepts are likely to soar over your preschoolers head, the sheer amount of interactive exhibits and sights and sounds are sure to keep your toddler entertained, especially the Idea Factory exhibit in the museum's lower level which was designed specifically with them in mind. 57th Street and Lake Shore Drive, 773-684-1414. The TILT experience allows guests to experience Chicago from a new angle from an enclosed, glass-and-steel moveable platform that holds up to eight people at a time. It allows guests to experience views of the Windy City, including 360-degree views spanning four states. It also showcases unparalleled views of the lake and the city skyline as well as interactive learning opportunities. 875 N. Michigan Ave., 94th Floor, 888-875-8439.